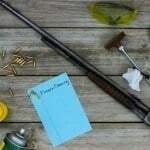 What Is the Best Gun Cleaner? Where Is the Best Place to Buy a Gun Safe? Winchester says that they won the West and now their goal is to protect what they’ve one. With more than 150 years of experience in the firearms industry, Winchester safes are some of the best available today. With innovative security features, solid customer support, and numerous advantages, the best Winchester gun safe reviews are a must-read before you finalize any purchase. Here is a guide to everything this legendary brand has to offer. Winchester makes 10 different models of gun safes as of 2016. They range in size from the entry-level Bandit to the top of the line Legacy. The 150th anniversary model is also a stunning display of craftsmanship. The chart below will help you find the right model that can meet your needs today. One of the most unique features offered on several of the best Winchester gun safes is the Notion sensor. You’ll find other manufacturers offer sensors that let you monitor who is accessing your gun safe when you’re not at home, but Winchester has taken this feature to the next level. The Notion sensor offers owners 8 different senses that work together so you are 100% certain that your valuables are properly protected. Notion will also protect your windows, provide you with smoke alarms, and notify you of water leaks that may occur. It can also tell you if your lights have been turned on without authorization, monitor access to your garage, and even let you know if your propane tanks are being accessed. The key to the success of Notion is that instead of just one sensor on the gun safe, you can install numerous sensors all over the house to give yourself an advanced level of protection. All you’ve got to do is place your sensors and then connect them to your local Wi-Fi connection. Installation can happen in just 5-10 minutes. But that’s just one of the features that can come with owning a Winchester gun safe. There are numerous other advantages that come with owning a safe from this brand. Winchester makes sure that every detail is checked twice before offering a gun safe up for sale. Their manufacturing process is so reliable, in fact, that you are guaranteed to receive a gun safe that is of an exceptional quality. If your safe is damaged, even if by fire or criminals, they will repair the safe free of charge. This includes free locksmith services to open the safe if you lose your keys. Winchester prides itself in its American manufacturing processes as well. They have recently invested millions of dollars into automated factories within the US border so that they can still provide great jobs while offering a great price on each model of gun safe offered. Considering Winchester can produce one gun safe every 2.2 minutes of the day, this Fort Worth based company is turning heads in the industry. The final advantage a Winchester safe is able to provide is the rigorous testing process that each safe goes through before the sales process. In the US, there are 4 home invasions that occur every minute. When you have firearms in the home, you need recessed doors, large locking bolts, and a reinforced doorjamb to help increase your ability to stop a thief from stealing your valuables. Instead of charging extra for these features, Winchester offers them standard on all models. 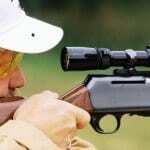 The easiest way to determine what Winchester gun safe is the best one to meet your needs is to examine the bolt size, the fire resistance, and the capacity of each safe. This is where the best Winchester gun safe reviews come into play. For example: did you know that the Bandit series by Winchester offers a 1 inch bolt size, 45 minutes of fire protection at 1400F, and can store up to 18 long guns with the largest model? Or that the Legacy 53 gun safe has a 2 inch bolt size, has 150 minutes of fire resistance at 1400F, and can store up to 51 long guns? Determining what model is the right one for you therefore depends on the budget you have and the amount of space that is available. The Bandit series is one of the best entry-level gun safes that you’ll find on the market today when storage space is at a premium. Even though it is an entry-level model, you’ll still receive a UL listed programmable lock, an auxiliary relocker, and an external hinge that opens the door to a full 180 degrees. 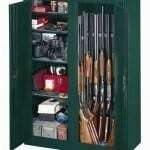 What Are the Prices of Winchester Gun Safes Today? If you purchase your Winchester gun safe directly from the manufacturer, then the maximum cost you’ll pay for a new safe as of February 2016 is $4,474 plus any applicable taxes and fees which may apply. That price is for the Legacy 53 model. On the other end of the spectrum, the entry-level Bandit 9 gun safe by Winchester is priced at $594. You can also purchase Winchester gun safes from authorized dealers, independent contractors, and online platforms like Amazon. When shopping online, it is not uncommon to find discounts of 5-15% off of the price offered when purchasing direct. When it comes to value, this gun safe from Winchester is one of the best options available. It features 1.25 inch steel locking bolts and a hard plate that is drill-resistant. At 560 pounds, no one is going to just cart this gun safe off if they break into your home. It provides 1 hour of fire protection and includes three layers of fireboard in the body of the safe to protect your guns from an extreme event. Make sure you have a dehumidifier available for this unit to prevent corrosion that may occur. It can hold up to 24 guns in total, but we found that about 16 fully equipped rifles is about the best it could do. Click here to check pricing on Amazon and get an awesome deal. This is the ultimate storage solution for your firearms and accessories at home. The gun safe itself weighs about half a ton and that’s before you put anything into it. We really love the door organizer has it contains more than a dozen pockets for added storage. Some of the pockets are large enough to hold your handguns if you wish. Breaking into the gun safe is virtually impossible thanks to the nine 1.25 inch locking bolts. Your firearms are protected against scratching thanks to the automotive grade carpeted interior. An investment for sure, but one that is definitely worth making. If the Range Deluxe is too big, but you still want all of the features that it can provide, then this is the gun safe for you. It also offers a slightly longer fire resistant rating at 75 minutes. There are fewer locking bolts compared to other top-of-the-line models (7 vs 9), but on this gun safe the bolts are also larger at 1.5 inches and made from solid steel. You’ll also have 7 additional interior supporting locking bolts to make breaking into the safe virtually impossible. The gray interior is soft and comfortable and you can store up to 54 guns with ease thanks to the modern design elements incorporated by Winchester. If you’re concerned about a fire at your home and what it could do to your guns, then we suggest an investment into this particular Winchester model. It provides 2 hours of protection against 1,400F external temperatures thanks to five layers of fireboard that are incorporated into the design of the gun safe. A four-way locking system supported by 12 locking bolts that are 1.5 inches in size add to the security you’ll receive. The capacity is about half of the largest models from Winchester, carrying a maximum of 24 guns, but at 800 pounds empty the weight is almost the same. If you want sturdy, this gun safe fits the bill. This electronic lock gun safe is one of the best gun safes of its type in the industry today. With 45 cubic feet of interior storage, you’ll be able to put all of your defensive firearms and hunting guns into one safe location. 18 solid steel locking bolts will prevent unauthorized access and so will the reinforced plate around the lock. The standard interior by Winchester will help to prevent scratching of your firearms and you’ll have enough space to store 50+ firearms safely depending on your setup. It might be made in China, but the quality is there and you won’t be disappointed. The best Winchester gun safe reviews will help you protect your guns effectively with a brand that took on the Wild West and won. Trust what this brand can provide you for storage solutions in even the most extreme conditions and you will have a gun safe to use for the rest of your life.